About: Have you ever wondered what goes on in the mind of a serial killer? Meet Kit, she was raised to follow in her mother’s footsteps, to be a serial killer. She has never felt guilt about what she was raised to do and kills with such “skill” and precision that she is dubbed the “Perfect Killer”. All of this begins to change when she be-friends one of her victims. She begins to question herself and her motives for killing. Circumstances become even hairier for Kit when her mother brings over the police officer leading the Perfect Killer case. What I liked: I loved this book because I had to see if Kit’s indifference when it came to killing ever changed. I was intrigued to read about a charter that isn’t all that likeable and really has no remorse about who she is and what she does. 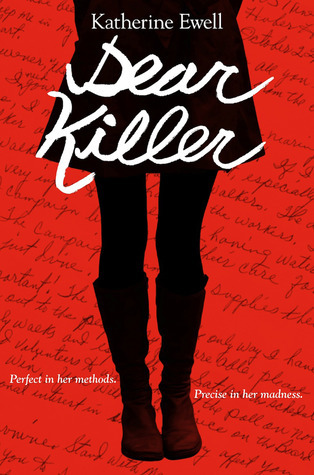 Filled with gory descriptions of murder Dear Killer offers a lot for readers to savor and discuss. This entry was posted in murder, Suspense, Thriller, Veronica and tagged Murder, Suspense, Thriller, veronica. Bookmark the permalink.